Beautiful buck! There's nothing quite like whitetails in a snow storm. Awesome !!!! Beautiful buck in the snow ! Nice one! Way to go! Congrats! I would love to take a good one in the snow like that. The woods seems so still and quiet when snowing those great big flakes like that. Nice deer. Sounds like a nice year of hunting for ya too. 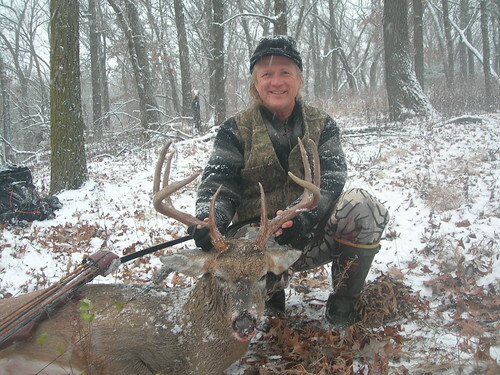 Nice Buck! I killed one about the same size on Nov2 and a button buck sunday so I'm done for this year. Now the 3 year wait to go again. Thats a purty deer!!! Love hunting in the snow! Now that is one hell of a deer. Awesome job!